Mitchell 1 has updated its ProDemand® repair, diagnostic and maintenance information program with ProView, a new troubleshooting tool to help service professionals relate diagnostic trouble codes (DTCs) and symptoms to components. Once a code or symptom is selected in ProDemand, ProView provides all of the known fixed components for that code or symptom, or multiple codes and symptoms, based on real-world content. This allows technicians to quickly see the most commonly repaired components and plan a diagnosis strategy to resolve the problem. 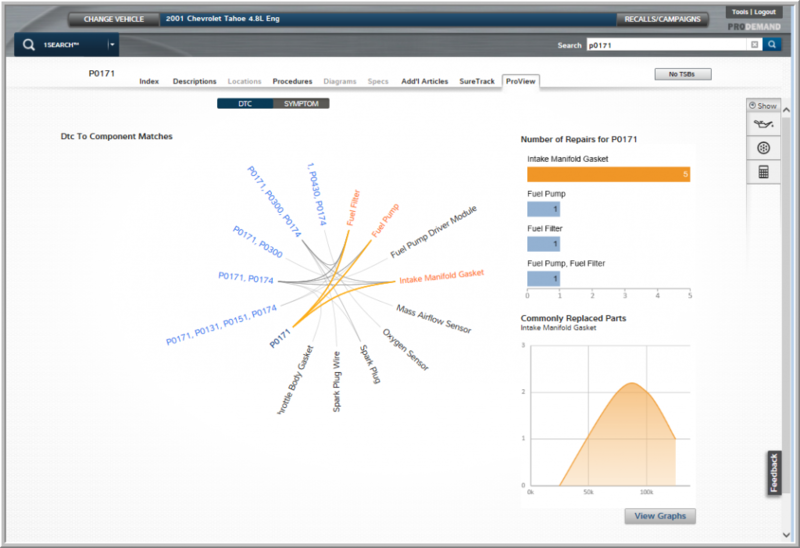 The ProView feature is graphic-based, delivering an alternate view of possible repair solutions via three charts: a radial graph that shows the relationship of the code or symptom to possible at-fault components, a bar chart that lists the most commonly replaced components for that code or symptom and a graph that shows the mileage at which the most common component is replaced. ProDemand provides full OEM repair, estimating, maintenance and real-world information built to help technicians work faster and more accurately. Technicians enter a diagnostic trouble code, component or symptom and ProDemand returns information from Mitchell 1’s extensive library of OEM content as well as detailed parts replacement records, tips and Real Fixes from SureTrack’s expert-based information database. ProDemand is also integrated with Manager™ SE, Mitchell 1’s industry-leading shop management system, further streamlining workflow to increase shop efficiency. For more information, visit www.mitchell1.com, call (888) 724-6742, or locate an independent sales consultant at www.mitchellrep.com.